Choosing a full-sized sedan to drive around town doesn't have to be difficult. 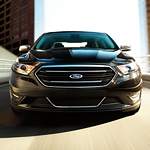 The new Ford Taurus is designed to be a bold vehicle that makes a statement wherever you take it. Sheehy Ford of Gaithersburg can explain the features that are unique to each model so that you can get the vehicle of your dreams. The SHO grille is unique to the model and unmistakable. The black mesh is accented with a chrome border that makes a strong statement when you arrive to your destination. The sleek HID headlamps are perfectly integrated into the body of the Ford Taurus and add to the sophistication of the design. They'll keep you safe by turning on automatically in low-light conditions or when you're running your windshield wipers. In the back, the lines of the Ford Taurus are finished off with dual chrome exhaust tips.